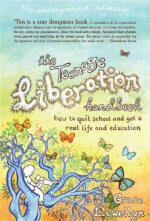 Teenage Liberation Handbook: How to quit School and Get a Real Life and Education by Grace Llewellyn. This is a terrific book! Written especially for teenagers and people with teenagers in their lives, it is also helpful for anyone who has ever gone to school. Grace discusses how to regain the natural ability to learn and be excited about it, ways of going to college, volunteering, apprenticeships, and more. Leans toward an "unschooling" approach, which Grace is able to superbly articulate. Popular for teenagers who plan on taking charge of their education, whether they are currently homeschooling, planning on homeschooling, or moving on to college. Highly recommended. Paper, 443 pages. This is the complete, international, revised and expanded edition. There is another less-expensive version available, but it only contains about 1/3 of the content. This edition has more anecdotal material and background information included for each topic and is recommended by the author.